It may be too cold to go outside. It may be too cold to turn on the Gorilla Channel. But it’s certainly not too cold to solve this week’s ScuttleButton puzzle. ScuttleButton, as you may know, is that weekly waste-of-time exercise where we post a vertical sequence of campaign buttons. Your job is to take one word (or concept) per button and add ’em up to arrive at a famous name or familiar expression. Guess the correct phrase and you could be the proud winner of the coveted Political Junkie button! Enter your submission using the convenient submission form below, or email your submission to [email protected]. You must include your name and city/state to be eligible. I Love Ringo — Ringo Starr, the Beatles’ drummer. No More Koreas/U.S. 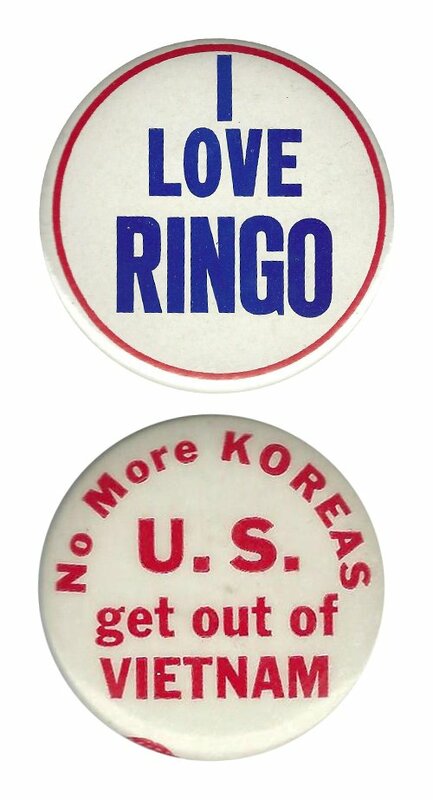 Get Out of Vietnam — A 1960s protest button warning that the Vietnam War was becoming as unwinnable for the U.S. as the Korean War. Star Wars. The series of movies created by George Lucas that began in 1977. And the randomly selected winner is … Harvey Kaufman of Belmont, Mass. Harvey wins the coveted Political Junkie button.